If looks could convey fragrance, then this 60sqm condo unit's aroma is irresistible to the eyes. "I want it to look mabango," was the client's main request for the unit, which designer Eric Paras and team took to heart to create interiors that hypnotize you into staying over. The unit is intended to be a halfway home where the owners can host parties or small get-togethers. There is a muted sense of calm the minute you walk along the terracotta-colored walls of the foyer, which leads to the loose setup of the living area. 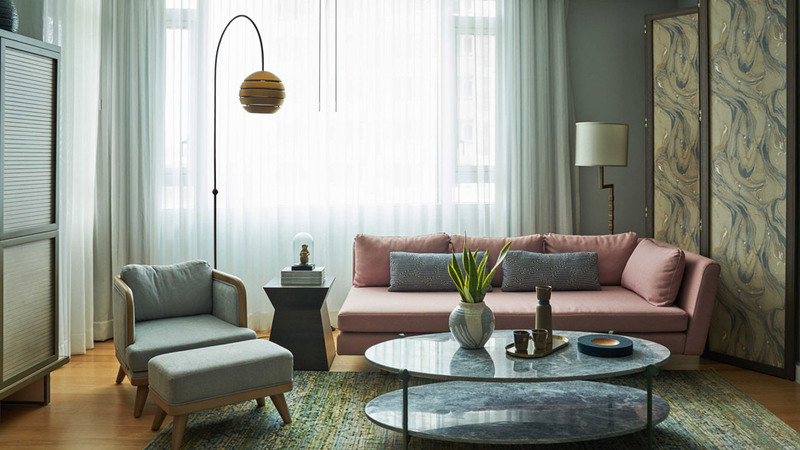 Here, Eric's concept for the unit is on full display—pastels for the color palette, eclectic pieces that don't distract from the overall look, and custom-made furniture. The client wanted the unit to cater to younger people, as it is mostly their children, grandchildren, and other relatives who will be using the space. The colors, apart from softening the look of each area, imbue a youthful vibe that will certainly appeal to younger generations. These are balanced by accents that are heavier on the eyes, such as metal frames for some of the furniture and copper hues for a number of decor and lighting. One can't help but feel freshened up in this unit, making it an ideal spot to hang out in. It's a space that brings calm and cheer, an oxymoron only a seasoned designer can translate to reality.